Nokia Australia this morning announced that the Lumia 625, a budget 4G, Windows 8-powered smartphone, will be available from August 23. The screen on the Lumia 625 is the Nokia’s largest smartphone screen to date, at 4.7 inches. Onboard is 8GB of storage, upgradeable to 64GB via Micro SD card. Additionally you’re given 7GB of cloud storage. Apps and services included are Calculator, Clock, Calendar, Phonebook, Alarm clock, Reminders, To-do list, Social networks in Phonebook, OneNote, Wallet, Family Room, and Kid’s Corner. Fr business users, it includes Adobe acrobat reader free download, Lync (Corporate IM) free download, SkyDrive storage for documents and notes, Company Hub for enterprise applications, and the Excel, Word, Powerpoint and OneNote apps. The Lumia 625 will be available in Australia in the black and white colours, with changeable colour shells – pictured below – available separately to change the look of the phone. 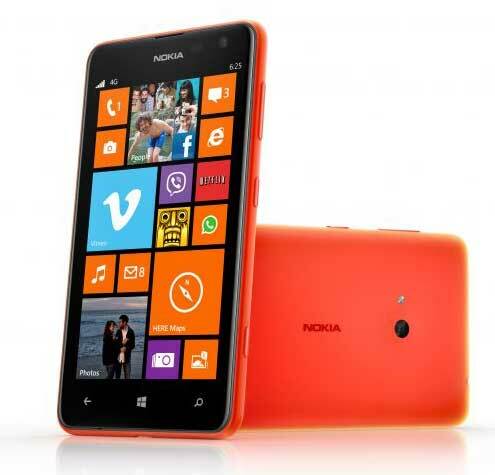 A free orange colour shell will be provided to purchasers of the Nokia Lumia 625. Telstra and Optus will have the phone in stores at the end of August, with Virgin Mobile following in early September. If buying outright, the Nokia Lumia 625 will have an RRP of $399. Previous ArticleHow long does a Fitbit last?